This Suwannee point was found many years ago in the Santa Fe River in Gilchrist County, Florida. It's made of a black colored chert that is not the best quality. But this is a good representative example of a Suwannee point. It measures 4 3/8 inches (11.1 cm) long. Suwannee points were named by Ripley P. Bullen after the Suwannee River and Suwannee County in Florida. The age of Suwannee points still seems to be in question. 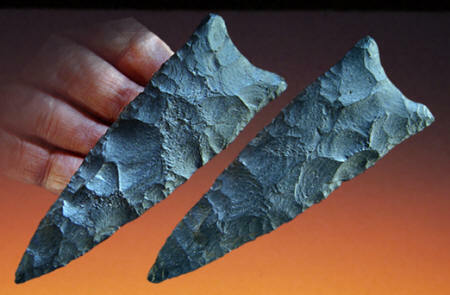 Some researchers have placed Suwannee points in the Early Archaic period while others believe they are older. For example, James Dunbar (Senior Archaeologist, Public Lands Archaeology, Florida Bureau of Archaeological Research) writes that: "Most archaeologists, including this author, place Suwannee points as the post-Clovis, Middle Paleo-Indian type." He also says that Suwannee points have tool kits that are similar to Clovis tool kits. Some Suwannee points have multiple flutes and were made with over-shot percussion (edge-to-edge) flaking. Suwannee points are found in the coastal plain of Florida, Georgia, and South Carolina. 2006, Dunbar, James, Webb, David S., "Paleoindian Archaeology," First Floridians And Last Mastodons: The Page-Ladson Site In The Aucilla River, p.408-409.